A small constellation in the Southern Celestial Hemisphere. Its name means "raven" in Latin. I finished my Corvus jacket, my entry into the 2017 Refashioners challenge, nearly a month ago, and then had to set it aside, hoping and praying for cold weather, even as the East Coast has experienced one of the warmest falls on record. Last Friday our plans (for a walk through Prospect Park), the weather (65°F and sunny), and a swiftly-approaching deadline (the Refashioners 2017 #suitsyou challenge ends on October 31st) all combined to give me the kick I needed to photograph this jacket. Spending the day wearing the jacket also made evident some of the good and bad decisions I made during construction, and since I plan to sew this pattern again (in a waxed cotton, for the full Belstaff Roadmaster effect), I've listed below my comments on any fit adjustment and design I'll need to incorporate into the next iteration. 100% wool grey heather Paul Stuart men's suit size 42, bought at Goodwill for $29.99. I was pleased with the selection at my local Goodwill, but irritated as usual for the "big-city-tax" that made this suit cost more than double what I would have paid in a smaller town. Thrift store shopping here is not actually that thrifty. Even with only 1/4" seam allowances on the pattern pieces, the disassembled sleeves were barely large enough. My initial feeling, looking at the suit, was that I'd have more than enough fabric to make my jacket. Once I finished disassembling the suit jacket and pants (and unpicking miles of hand-sewn pad stitching) and actually laid out the reclaimed fabric pieces, though, I realized I'd just barely be able to eke out my jacket, even re-using many details of the original suit. The pattern is adapted from a slim parka I made for myself 6 or 7 years ago in silk shantung, which pattern was itself adapted from a basic parka pattern I received when enrolled in Prof. Tommaso Proscia's Outerwear course at FIT. I was very inspired by (read: I copied) the Belstaff Roadmaster, as pinned on my Refashioners 2017 board The original parka was quite boxy and long, and the sample from that class is now worn by my 6'4" partner. The slim parka differed from the original in width and length, but the details remained the same. 1. Enlarged and squared off the chest pockets, and added flaps. 2. Added hip pockets and flaps. 3. Added hip welt pockets. The belt loops were taken from the original trousers, and the belt was made from the original waistband, including the interfacing! 4. 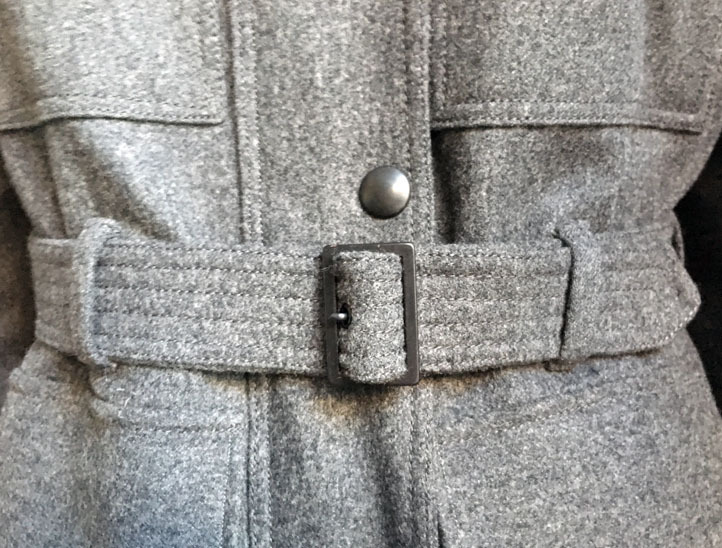 Added a self belt and belt loops at waist (made from the original trouser waistband and belt loops!). 5. Added a tab and buckle underneath collar. 1. Back pieces couldn't be cut on the fold, and were seamed instead. 2. Side front had to be pieced. 3. Pocket flaps were cut on the cross-grain, and therefore look a little jarring against the on-grain patch pockets. 6. Nixed the sleeve cap and shoulder pad details from the Belstaff design, due to lack of fabric. The inside chest pocket in the original jacket, on the left, and in the Corvus jacket on the right. 1. Inside chest pockets from original jacket. This jacket doesn't lack for phone-sized pockets, but I love having personal pockets inside my jacket in which to stash my phone. 2. Hip welt pockets: I lined these in cotton flannel, and will continue to add that detail to jacket pockets forever. The pockets are a warm and toasty hideaway for my hands! 3. I underlined the lining with Thinsulate. Last time I made this pattern, I underlined the self fabric, but because I intended to press the self fabric shell quite a bit thoughout construction, I opted to underline the lining instead. I'm still not sure that was the best decision, but I only scorched the Thinsulate at the edge of one sleeve, and the jacket is fiercely warm, so I'll count it as a success. 1. Cut the correct sleeve length! One of the main reasons I sew for myself is so that I can fit my garments to my non-standard measurements. I have very long arms, but every jacket I've ever sewn has sleeves that are too short! Why do I keep making this horrible mistake? So, for the next time I sew this pattern, I'm going to add 3/4" to the sleeve length. 2. Measure the CF zipper length correctly! I forgot to include the collar measurement with the front zipper measurement, so in result the zipper stops below the collar. This doesn't look odd, but I prefer this jacket pattern with the option of zipping the jacket up all the way to the top of the collar. This necessitated adding the collar belt and buckle, which is an authentic addition, but quite fiddly in reality. 3. Reconsider the pocket placements. I wasn't thinking properly when I plotted out where the chest and hip pockets should be placed in relation to the center front; in result, the pockets are much too close to the front, and barely give enough space to the snaps at the placket. Additionally, the hip welt pockets were afterthoughts, and ended up placed a bit far back to reach comfortably. They work, but they're not ideal. I am giddy with the knowledge I'll get to wear this jacket now. I anticipate getting a great deal of wear out of it; I have longer, proper winter coats, but no other short and warm coats for the fall-to-winter season. I'm very pleased with this project, and grateful to Portia and the Refashioners challenge for encouraging me on this reclamation adventure! Suit, Goodwill on Hoyt st. in downtown Brooklyn. Thinsulate: B & J Fabrics, bought in person at the 7th Avenue store. Snaps, Buckles and snap application: Botani Trimming, bought in person at the 36th st. store. Zipper and topstitching thread: Sil Thread, bought in person at the 38th st. store. Lining, sleeve lining and cotton flannel: from stash, probably bought online from Fashion Fabrics Club.